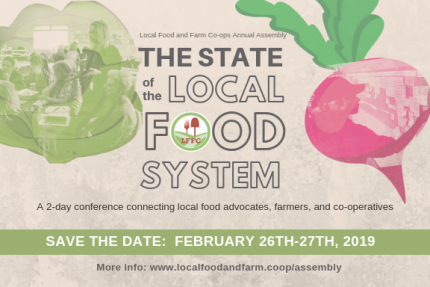 The Local Food and Farm Co-ops 10th Annual Assembly is taking place on February 26th and 27th at Ignatius Jesuit Centre in Guelph, Ontario, and early-bird pricing is available until January 18th! This year marks the 10th anniversary of the conference, which brings together leaders from the food co-op sector, farmers and food system activators to share knowledge, build new skills and develop strategies for advancing the local food system. The event will deliver sector-specific workshops, sessions geared toward each type of co-operative, governance, public speaking, member engagement, troubleshooting sessions and more. The second day of the assembly will be dedicated to exploring how the co-op and local food sector can develop a strategy to address emerging issues within the Ontario system. For more information, tickets, and up-to-date details, visit www.localfoodandfarm.coop/assembly.